THE "Spirit of the Orient" appears to be invading not only American trades and market gardens, but its art and architecture. From the solemn groves of Nikko, from ancient castle moats and mountain shrines, from the wet, shining leaves of water gardens in old Nippon, from the soft curves of the flowing roof lines and the tender tones of the untouched wood surfaces, our modern house-architects are drawing inspiration for new and delightfully "different" effects. 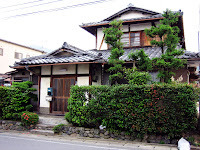 Local character in architecture is always a fascinating study, and the high standard of culture in Japan, the refinement of art developed through centuries by a people devoted to the ideal, must of necessity impress itself upon their architecture. While the mere draughtsman, wedded to conventional forms and accustomed methods, would find Japanese architecture only absurd and impracticable, there are architects who are artists as well, and who find in these sources a delightfully suggestive and enriching field of study. 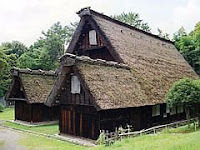 They know that thatched roofs and light sliding partitions are not practicable for American homes, nor do they desire to copy Japanese ideas merely because they are foreign and strange. Charming and interesting as is Japanese tradition in architecture, it is so for Japan and not for us, and it would be foolish indeed to attempt to naturalize in this country many of their local idiosyncrasies. But the sympathetic student of architectural forms finds much real beauty that can be used to impart a fresh interest to jaded ideas. 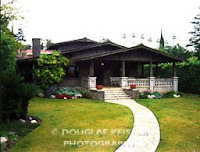 In the houses here mentioned, Messrs. Green & Green of Pasadena, California, have attempted to naturalize in a new world environment the usable and livable features of Japanese architecture. The highly picturesque character of the natural surroundings -- the houses being situated on high ground overlooking the wild gorge of the Arroyo Seco -- is admirably suited to a certain irregularity and picturesqueness of architectural treatment, and the introduction of Japanese suggestion accentuates the charm. Although the motif is picturesque, it is not carried to extremes, but an effect of simplicity is obtained in a composition which is in itself rather loose and complicated by the simple treatment of detail. The Japanese system of bracketing, for instance, said by authorities on art to be the acme of perfection for wood, has been adopted in these designs with happy results. Without employing the queer quirks and angles of Japanese roof lines, their graceful curves, so difficult to achieve, are sufficiently marked to render impossible an effect ordinary or common-place. While there is a decided Japanese feeling, nothing has been carried to extremes, and the slightly foreign accent has been so modified by principles of good domestic design as to give a wholly normal and satisfying result. The different features are harmonized with admirable skill and a sane and sound judgment. Hard-burned clinker bricks set roughly in dark mortar are used in the foundation and in the entrance pillars and chimneys, strikingly combined with large, mossy boulders brought from the near-by mountains. The warm purplish-brown of the brick in combination with the mossy boulders and the soft grays and browns of the wood construction give a color effect of great beauty and softness. The chimneys are strongly suggestive of Japanese influence, as are also the treatment of the windows and the open rafter work. Great simplicity characterizes the construction, which is all exposed and made to form the decorative features. The timbers are mortised together with oak pins, and nails are used scarcely at all in the construction. While groups of mullioned windows are largely employed, Japanese suggestion is again felt in the narrow slits of windows which open on the side terrace, with but one long, narrow light, divided in the center by a single wood muntin [sic]. No attempt has been made to introduce Japanese ideas in the interior arrangement, which is that of the usual high-class modern home. The living and dining rooms are heavily wainscoted and beamed, the solid ceiling beams of the construction being exposed in true CRAFTSMAN style. 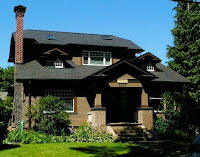 Simple CRAFTSMAN ideas are carried out in the finish and furniture. 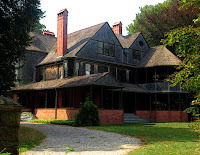 Two views are given of the architect's own residence, which nearly adjoins the house just described and which embodies similar ideas. That all appearance of sameness or monotony of treatment should be entirely absent from designs based upon the same general picturesque motif is evidence of the skill and fertility of the designer. Such architecture can be the result of no hard and fast rules. Not only must the architect possess the artist temperament to begin with, but the trained eye for harmonious detail, the eye as sensitive to discords of form and color as the trained ear of the musician is to discords of sound. It is the aim of these architects to interpret these subtle harmonies by their work, and above all things to have all construction and materials true to their own nature, believing that brick treated simply as brick, stone as stone or wood as wood, is better than any disguise that can be put upon them. Interesting how it was asumed that a mere copy of a Japanese style would be useless outside that root culture, a mere pastiche. Japanese techniques would have to be used in conjunction with American styles. seems like a good healthy perspective for 1907. Also interesting that the 'bungalow' format was originally Indian, with the idea and name being brought back by the British, so the humble bungalow, which is often sneered at in Britain, could well have a complex multicultural history all of its own! interesting, d! i hadn't noticed that. i don't have a guess other than wondering if greece and japan share some geographical consideration that italy doesn't. well, she did have a point when it comes to paper walls! (when i was in japan, i accidentally put my foot through a (paper) window! my understanding is that it's more the word than the physical structure, john, that has the multi-cultural heritage. but then i haven't looked into the indian structures--maybe it's time! A 'Bangla' was a single story house. The word literally means 'house in the Bengal style. One of the early British power bases in India was Bengal, which is now split between West Bengal in India and Bangladesh. In fact, the old capital of the British Indian empire was Calcutta, in Bengal. The British army introduced many habits and lifestyle choices into Britain from India, including the single story Bengal style house, which they were used to living in in India and felt more at home with in Britain than the traditional two story.